Ah, the lazy, hazy days of summer. There’s more time for rest and relaxation, vacations and stay-cations, and quality time with family and friends. We’d like to suggest another important way to spend quality time—bring your kids to see the children’s dentist in Dix Hills. Our board-certified pediatric dentist, Dr. Shubha Soni-Gaur, wants to make your children’s visits to our office fun and relaxing. This may take a little extra time, so why not visit us during the summer when you and your kids aren’t quite so rushed? In the meantime, read on for more important information about your child’s oral health. When Should My Child Begin Seeing the Dentist? In keeping with the recommendation of The American Academy of Pediatric Dentistry (AAPD), Dr. Soni-Gaur would like to see your children by the time they are one-year-old or within six months of when their first tooth appears. Why so early? Those baby, or primary, teeth are very important. Aside from a smile that melts your heart, your baby or toddler’s teeth allow them to chew a variety of healthy foods and learn to speak clearly. In addition, baby teeth save space for permanent teeth. Therefore, the sooner your pediatric dentist in Dix Hills sees your children, the better. What Happens at a Children’s Dental Checkup? At your child’s first dental checkup, we’ll count the number of teeth they have, talk to you about how best to care for your child’s teeth and mouth, and what milestones to expect as that precious smile develops. As your children mature, their dental checkups will become much like your own. We’ll still count their teeth, but in addition, we’ll provide a thorough dental cleaning, examine each tooth for cavities, look for signs of gum disease, and take annual digital x-rays. 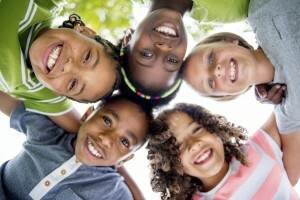 Summer is the perfect time for children’s dentistry in Dix Hills. Our entire staff expertly provides dentistry for children in Dix Hills. We look forward to helping you maintain your child’s healthy and happy smile! Call our office today.